"Persian" redirects here. For the cat breed, see Persian (cat). The Persian alphabet used in Iran and Afghanistan is very similar to the Arabic one, but the language is in a different family than Arabic, so their vocabulary and grammar are very different. Since the 1930's, in the countries which used to be in the Soviet Union, like Tajikistan and Uzbekistan, Persian has been written in an alphabet that is similar to the Russian one. In the past, all Persian speakers used the one based on Arabic. Persian is a very old language, and linguists have names for three different versions of Persian that were used in three different times. Old Persian was spoken in the first Persian empire, under the Achaemenid kings, including Cyrus and Darius the Great. This first empire started in the 6th century BC and continued until Alexander the Great conquered it. A second Persian empire, the Sassanian kings, ruled from the 2nd century AD until the conquest by the Muslim Arabs in the 7th Century, and Middle Persian, or Pahlavi, was spoken by them. 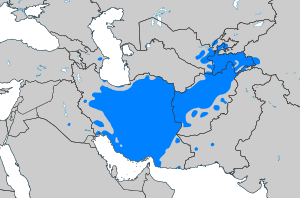 The current Persian language, New or Modern Persian, was first written down in the 9th century during the Samanid empire, which was the first Muslim Persian kingdom, and was based in Central Asia. The earliest writers of New Persian included poets like Rudaki, and Ferdowsi, who wrote an epic called the Shahname, translated as the Book of Kings in English. It is a very long poem, which has myths and historical stories from before the Arabs conquered Persia. Many of the other famous writers in the Persian language were poets too, such as Saadi, Hafez, Rumi, and many more. Up until today, the Persian language was a very important one for literature. After Arabic, it was the second most used language for writing in Muslim countries, especially in the East. من یک پارسی هستم و یک کتاب دارم. I am Persian and I have a book. ↑ 1.0 1.1 1.2 1.3 Samadi, Habibeh; Nick Perkins (2012). Martin Ball, David Crystal, Paul Fletcher. ed. Assessing Grammar: The Languages of Lars. Multilingual Matters. p. 169. ISBN 978-1-84769-637-3 . This page was last changed on 9 February 2014, at 07:24.